17 Woodlands Terr, Glasgow. Tel: 01413327013. 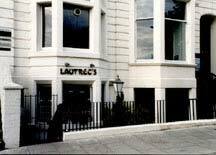 Alan Tomkins opened his first venture, Lautrec’s with a partner in 1982. Since then he steadily expanded to have interests in the businesses listed below. His motivation has been to expand with diverse styles of operations; thus the span from vodka bars to award winning seafood restaurants. Additionally, Alan was one of the founders of The Glasgow Restaurateurs Association and Chairman between 2001-2005. He was a former Director of The Greater Glasgow & Clyde Valley Tourist Board (2002-2005) and a former Board Director of Glasgow City Marketing Bureau (seeeglasgow.com) 2005-2009. Since 2005 Mr Tomkins is a Board Director of The Prince and Princess of Wales Hospice in Glasgow as well as Hospice Enterprises Ltd, the Hospice’s ‘retail’ arm of 16 hospice shops. Booly Mardy’s, Vinicombe Street, Glasgow –2003-2012. The Western Club Restaurant, 32 Royal Exchange Sq, Glasgow – opened Nov 2014. Alan's first business venture, Lautrec's Wine Bar & Brasserie opened in Glasgow as far back as 1982, and since then he has expanded his interests to some of Glasgow's most notable establishments. His current interests include; Urban Bar & Brasserie in St Vincent Place, Kuta in Bath Street, Vroni's Wine Bar in West Nile Street, Ashton Lane's Vodka Wodka and Blue Dog, a late night music/piano bar in West George Street. Former establishments, including Papingo Restaurant, Gamba Seafood Restaurant and the Southside's Urban Grill all achieved AA Rosettes and Michelin Guide status as well as many Glasgow and National restaurant awards. In 1999 Alan launched his own online wine company, Wineorama.com and is also a Director of online dining site PriceYourMeal.com. Alan is also a former Board Director (2005-2009) of the Glasgow City Marketing Bureau (GCMB), and is a committee member of the Glasgow Chamber of Commerce Tourism, Retail and Leisure Policy Group and the GCMB's Industry Leaders Group. He is the former chairman (2001-2005) of the Glasgow Restaurateurs Association, an alliance of Glasgow's top restaurants and creator of the annual Glasgow Food Festival GourmetGlasgow and a former Board Director of The Greater Glasgow & Clyde Valley Tourist Board. Alan is currently a Board Director of The Prince & Princess of Wales Hospice in Glasgow.